This schedule is valid no longer. Below is the most recent schedule for the Sylvia Plath Symposium, you will note the addition of some of the panels; including shortened panel titles, and the last names of the panelists. I apologize if it is hard to read; the formatting doesn't stick. Sylvia Plath "Did you know..."
Did you know that as Sylvia Plath prepared to graduate from Newnham College at Cambridge University in 1957, after two years of studying and writing, she submitted to the English faculty a manuscript of poems entitled "Two Lovers and a Beachcomber by the Real Sea"? This has come to be known as "The Cambridge Manuscript". She formed this poetry collection over the course of her Fulbright years, and sent various versions out to publishers in the US, in particular, to the Yale Series of Younger Poets, which she failed to win year after year. The manuscript was lost for about a decade, but it was found around 1967/8. In their 7 February 1969 issue, The Cambridge Review ran a number of essays on Plath. A. Alvarez submitted a short essay entitled "Sylvia Plath: The Cambridge Collection" on the poems, and printed along side the essay in this issue were the following poems, "Street song," "Natural history," "Resolve," and "Aerialist." Other articles in the issue were: "In extremis" by George Steiner, "Sylvia Plath and the problem of violence in art" by David Holbrook, "I am I" by Eric Homberger, and "Rememberinng Sylvia" by the cryptic M.W.C. If anyone can sort out who M.W.C. is, please let me know. The Manuscript, Archives, and Rare Book Library at Emory University, Atlanta Georgia, owns the Ted Hughes Papers, 1940-1997. These papers include "correspondence, writings by Hughes, materials relating to Sylvia Plath, writings by other authors, subject files, printed material, photographs, personal effects and memoriabilia, and audio-visual materials". In this collection is a separate series of materials by Sylvia Plath. The Plath materials, in Series 3, "consists of materials relating to Sylvia Plath including writings (poetry and prose) by Plath, writings by others about Plath, printed material by and about Plath including reviews of her works, materials relating to books published after Plath's death, and information regarding the Plath holdings at Smith College and Indiana University." "Any material relating to Sylvia Plath that was found on the verso of another item elsewhere in the collection was photocopied and added to this series, with a note on the bottom as to where the original item is located in the collection." The Plath materials are organized in the following way: Poems, Prose, Posthumous books, printed materials, writings by others; holdings in other repositories, and other material. Other material is my favorite way to classify the hodge-podge that inevitably enters an archive with any set of papers. Several years ago I requested photocopies of some of the materials in the collection, and found the archivist I dealt with to be friendly and efficient. It was in part due to interactions with her that I am now studying to be an archivist. The entire collection is worthy of review if you find yourself in the Atlanta area. The finding aid to the Ted Hughes papers is online here. The Plath materials are in Series 3. The picture above is taken from here. A Sylvia Plath "Did you know..."
Sylvia Plath's Pulitzer Prize winning book, The Collected Poems, is a remarkable assemblage of poetry. One wishes that it was a complete edition, printing all of her early poetry. But, did you know that the Index in the Harper paperback edition is missing one of Plath's best poems? If you guessed choices A-D, you are incorrect. Choice E, 'Daddy', is the missing title from the Index. I need to check to see if the first line is also missing, as those are indexed as well. The poem is listed in the first Harper edition (1981), as well as in the Faber editions (hardback and paperback). The Bell Jar is a very unusual book in that it had three different first editions by three publishers within a decade!Of course the first was the 1963 Heinemann edition by "Victoria Lucas". The second was in 1966 by Faber under Plath's name. And the third was the 1971 US edition by Harper & Row. Only the US edition(s) have the Afterword by Lois Ames. Similarly, the US edition of Ariel featured a foreword by Robert Lowell. The UK edition, which preceeded the US edition by several months, has a slightly different order, and no foreword. Careful readers of Plath's poetry, notably poems in The Colossus (1960 Heinemann/1962 Knopf), would have noticed the similarities between two of the poems in that collection and some scenes in The Bell Jar. Those two poems were "Suicide Off Egg Rock" and "Point Shirley". 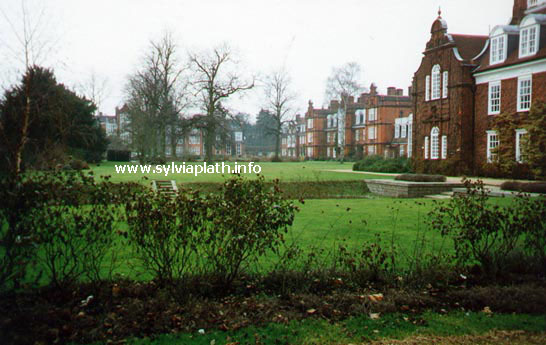 The University of Reading holds some materials related to Sylvia Plath. From what I can find, the have some correspondence between Plath and members of the BBC, from 1960-1962. Additionally, they have two other collections relating to Linda Wagner-Martin's 1987 biography of Plath, published in the UK by Chatto & Windus Ltd. Both collections appear to be correspondence. Contents: correspondence concerning publication of Sylvia Plath: a biography / by Linda Wagner-Martin (1988) (ISBN 0701131268). Includes: 14 letters, a cv and bibliography, and a proposal for a book about Gertrude Stein and her family, from Wagner-Martin; 15 letters from literary agent and Plath's sister-in-law Olwyn Hughes; 4 letters and 3 telex messages from Simon & Schuster, publishers of the book in the United States of America; 8 letters from solicitors Simons Muirhead & Burton who read the book for libel; a legal opinion from Geoffrey Robertson Q.C. on copyright; 6 letters from literary agents Abner Stein; reviews of the US and UK editions; comments on the text from author, publishers, solicitors and Olwyn Hughes; and other papers. Contents: correspondence in preparation to publish Sylvia Plath: a biography / by Linda Wagner-Martin (1988). Includes: 6 letters and an author's questionnaire from Wagner; 12 letters from Simon & Schuster, publishers of the book in the United States of America; 1 letter and a detailed list of comments on the ms from Ted Hughes; 10 letters from literary agents Olwyn Hughes; 4 from literary agents Abner Stein; and other papers. The Library at University of Reading web site is here. A HOUSE once lived in by poets Ted Hughes and Sylvia Plath has gone up for sale for more than half a million pounds. The couple began probably the best period of their stormy six-year marriage at 55 Eltisley Avenue in Cambridge, living there from October 1956 to May 1957. Selling agents Pocock and Shaw describe the house in the Newnham area of the city as a spacious four-bedroom family home in a much sought-after residential location. The famous couple were a little less prosaic. In her letters, Plath talked about the Edwardian grate and the apple tree in the garden, and Ted Hughes, who in 1984 was to become Poet Laureate, wrote a poem called 55 Eltisley Avenue. Dr Terry Llewellyn, a retired director of German Studies at Christ's College, Cambridge, is selling the house. He said: "This house was converted into two flats back then. It had a typical English kitchen and Sylvia Plath, being American, was used to the latest technology but she coped and cooked for Ted Hughes and his friends. "In her letters she talks about the Edwardian grate and the apple tree in the garden, which are still there now. "We've had quite a lot of people coming here, mostly American women who make a pilgrimage to the city. I show them what there is to see." Sylvia Plath, author of The Bell Jar, came to Cambridge on a Fulbright Scholarship, and embarked on a two-year course at the university. She was affiliated to Newnham College and lived at Whitstead, a college building in Barton Road. Jean Gooder, who is a retired director of studies in English at Newnham, remembers both Plath and Hughes from those days. She said: "I was a contemporary of Sylvia Plath and did not know her well because she was a year behind me as she came over to do the two-year course and one didn't see much of the other years. "I remember she was quite a blonde bombshell and very ambitious and clearly heading straight for the elite literary heights of Cambridge and of course she met Ted. "I met him and he was quite a formidable, dark and fascinating figure; very powerful and influential. He moved with a small group and they clearly were, in literary terms, the most creative. They were not following any conventional tracks at all but neither was she." The estate agents said they were close to selling the property, which is on the market at £550,000. The Lilly Library at the Indiana University, Bloomington, holds the Gordon Ames Lameyer Papers, 1953-1956. They also hold a massive Plath archive, of which the finding aid is online here. Lameyer and Plath dated beginning around 1953, but he was not the only man Plath saw during their time together. Lameyer was eclipsed by fellows like Myron "Mike" Lotz and Richard Sassoon. There are 98 total items in this collection. On two research trips to Indiana in 2002 and 2003, I had the pleasure of looking through this collection. The photographs and slides are extremely well preserved; the color especially so. Used to seeing Plath reproduced only in black and white, seeing color photographs of her adds a very deep dimension to her likeness. Here is an abstract of the collection, "Consists mainly of cards and letters from poet Sylvia Plath to Gordon Ames Lameyer (1930-1991). Two poems by Plath are included in the letters: "Dirge in Three Parts" on page 4 of the Feb. 6, 1954 letter and "Sonnet for a Greeneyed Sailor" in the Apr. 1955 letter. Also present is an unpublished manuscript by Lameyer titled Dear Sylvia. A group of twenty-one color slides and twenty, mostly color, photographs, chiefly of Plath, complete the collection." Lameyer attemtped to have his memoir of Plath, Dear Sylvia, published in either the late 1960s or 1970s. Correspondence is on file in the Mortimer Rare Book Room that essentially thrashes his writing. If my memory serves, Fran McCullough, Olwyn Hughes and Aurelia Schober Plath discussed it. The Mortimer Rare Book Room at Smith also has "Letters from Sylvia", a piece written by Lameyer that includes correspondence from Plath, that appeared in the Smith Alumnae Quarterly, Vol. 67, no. 2 (Feb. 1976). The Archives and Special Collections at Mount Holyoke College, in South Hadley, Mass., holds the Kathryn Irene Glascock Poetry Prize Records, 1923 - . Plath competed in this poetry competition whilst an undergraduate student at Smith College. Plath (far right in the picture) was co-winner in 1955 along with William Key Whitman (third from right). I believe Lynne Lawner, who was a correspondent of Plath's from 1955 until Plath's death, is seated next to Marianne Moore. An article about the Glascock Prize, and some recollections from the 1955 contest, can be found here. The abstract for the collection reads, "Letters reflecting her association with the Kathryn Irene Glascock Poetry Contest, Mount Holyoke College. Includes her critique of poems by Sylvia Plath, co-winner of the contest in 1955." The collection contains 13 items. The Archives and Special Collections web site is online here. Oxford University Press has released the cover for Eye Rhymes: Sylvia Plath's Art of the Visual edited by Kathleen Connors and Sally Bayley. The cover art is by Plath, but I'm unsure of the title of the piece. The book should be out in time for the Sylvia Plath 75th Anniversary Symposium. For more information, please visit the web site of the Oxford University Press. The Harry Ransom Humanities Research Center at the University of Texas at Austin is one of the largest, most impressive, and fastest growing archives in the world. They hold the Anne Sexton Papers, 1912-1996 (Bulk 1953-1974). In these papers are a couple of Plath related items, including a copy of the ‘Mushrooms’ by Plath, written in 1959 and published in Harper’s in July 1960. The papers also include correspondence with Sylvia Plath and her mother, Aurelia Schober Plath, as well as letters to and from Olwyn Hughes and Ted Hughes. They hold four letters to and from Sexton and Olwyn Hughes, four letters to and from Sexton and Ted Hughes in Box 20, Folder 7. They hold one letter from Aurelia Schober Plath to Sexton in Box 24, Folder 4 and two letters from Sylvia Plath to Sexton, also in Box 24, Folder 4. The finding aid to the Anne Sexton Papers is online here. The web site for the Harry Ransome Humanities Research Center at the University of Texas at Austin is here. The Elmer L. Andersen Library at the University of Minnesota at Minneapolis holds a Children's Literature Research Collection. The collection holds the papers of children's book illustrator Emily Arnold McCully. 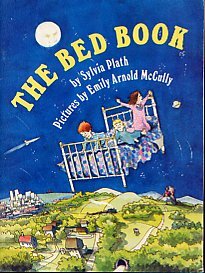 Plath book collectors will know her as the illustrator of the US edition of The Bed Book (published 1976). The British edition was illustrated by Quentin Blake. 40 p. ink, pencil, and watercolor dummy with holograph and typescript text pasted in. The call number is M.C. 618. This would be an interesting collection to see as the drawings and illustrations are a visual interpretations of Plath's book. The finding aid for the collection is online here. The University of Minnesota Libraries homepage is here. The Smith College Archives holds the Sylvia Plath Hughes Papers (1950-2001, bulk 1952-1963). These are papers primarily “contain biographical information, photographs, press releases, and writings by and about Plath.” A note on the finding aid indicates that most of the materials in the collection are previously published. Some of the material by Plath in this collection is likely uncollected, for example the press releases from 1952 and 1953 for the Smith College Press Board. For those with access to Stephen Tabor’s Analytical Bibliography and to either microfilm or back issues of the Daily Hampshire Gazette, you could read Plath’s reviews of events that the DHG published during her time as Press Board correspondent. The collection does contain some monographs, including a 1965 copy of Ariel, The Colossus and Other Poems. These are likely first editions. Additionally, there is a copy Stings, a limited edition facsimile of Plath’s drafts for the poem with an essay by Susan R van Dyne and of Ingrid Melander’s The Poetry of Sylvia Plath: A Study of Themes from 1971. The finding aid to the collection is online here. There is a related material note: “Additional information about Plath's Smith College experience may be found in the Class of 1955 records, the English Department records, student publications of the time, and a subject file on Plath which is available in the College Archives Reading Room. The primary source for Plath material at Smith College is the Mortimer Rare Book Room.” All of these resources will be useful to researchers of Plath. A note to all panelists and delegates for the Sylvia Plath 75th Year Symposium. Registration is now open! Please go to the web site, http://www.plathsymposium2007.org/, and click the Registration icon to complete the form. Registration for guests and other non-participants will open on 1 August, 2007. Please note that the dates for the Symposium have changed slightly. The dates are now 25-28 October; Monday the 29th is no longer a part of it. In 2005, I donated 259 photographs of Sylvia Plath related places to the Mortimer Rare Book Room at Smith College. This is a definitive selection from probably over 1,000 printed photographs from my own personal Plath photograph collection. 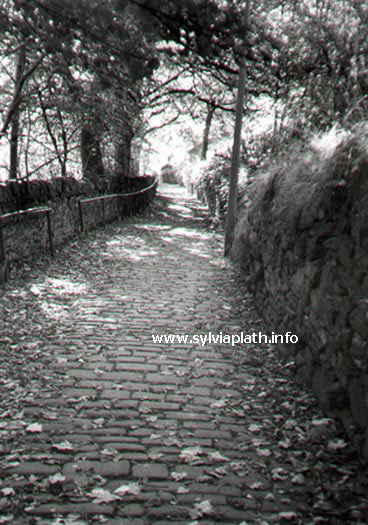 The photographs were taken from 1995-2005, and include Plath-related places from North America, England, and Ireland. Not only did I take a lot of pictures of Plath-places, but I got some frequent-flier miles too! The collection includes photographs of Plath's houses, schools, writing subjects, grave, and other places. A good portion of the pictures are scanned and are online at my own Plath web site, A celebration, this is. However, many of the photographs are in the collection only, and do not appear on the web. Included with the collection is a 9 page list of the photographs and a CD-ROM. I plan to show and talk about some of these photographs at the Sylvia Plath Symposium at Oxford later on this year. Registration for the Sylvia Plath Symposium, to be held at Oxford this fall, will begin for delegates on 15 June, 2007. Registration for guests will commence on 1 August. So far there are about 100 panelists, another 30 featured speakers and artists, and seating for 200 at the main featured speakers talks (another 100 seats for the other panels). The Symposium is open to all. Members of the press should contact Kathleen Connors at kathleen.connors@plathsymposium2007.org. In addition to the Edward Butscher collection of papers related to Sylvia Plath, Smith College's Mortimer Rare Book Room holds the Houghton Mifflin Company Collection of papers on Bitter Fame. 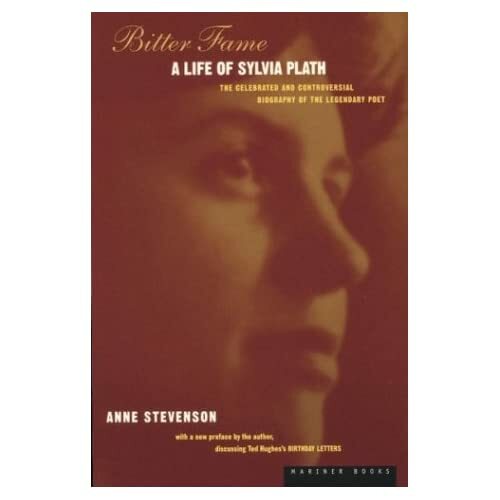 Bitter Fame: A Life of Sylvia Plath is the controversial and authorized 1989 biography of Plath written by Anne Stevenson. Stevenson notes in the text that Olwyn Hughes, Ted's sister, contributed so much to the text that she considers it "a work of dual-authorship". The collection is nine boxes deep. Box 1 contains separate series of correspondence of Peter Davison, Olwyn Hughes, and Anne Stevenson. There are multiple correspondents within each subseries. Some of the correspondents are Trevor Thomas and E. Lucas Myers. Boxes 2-9 contain Bitter Fame which is arranged in the order of creation, beginning with legal papers, successive drafts of the book, illustrations, a copy of the dust jacket, press clippings and other fragile faxes. I worked with the collection a number of years ago while on a research trip at Smith. The correspondence contains business-related information but also Plath-related information and is quite interesting. The drafts of Bitter Fame is also interesting for some of the material omitted from the final version. The Mortimer Rare Book Room in the William Allan Neilson Library at Smith College holds several different Sylvia Plath collections. The collection I will highlight here concerns Edward Butscher, Plath's first biographer. Butscher is almost single-handedly responsible for much of the information we know today on Plath. This does not necessarily mean he did a great job with the materials he collected, but all Plath biographers do owe him some credit. In fact, I have never successfully finished his biography; in some ways he may have done more harm than good. The collection begins with Butscher's correspondence. He was able to get information from a wide variety of sources. Some notable people in Plath's life are Richard Norton, Cyrilly Abels, Wilbury Crockett, and Myron Lotz, amongst many, many others. The collection also holds Butscher's research notes and manuscripts for his 1976 biography, Sylvia Plath: Method and Madness as well as his 1977 collection of essays, Sylvia Plath: The Woman and the Work. School notes of Sylvia Plath for "The Novelist & the Unknown": photocopy n.d. The finding aid to the Edward Butscher Collection of Papers on Sylvia Plath is online here. Use the sidebar on the left hand side of the screen to view the scope and contents notes, as well as series descriptions, and box and folder contents. The Mortimer Rare Book Room web site is here. The Neilson Library web site is here. In the Arthur and Elizabeth Schlesinger Library on the History of Women in America at the Radcliffe Institute for Advanced Study, Harvard University, there is a small collection of materials related to Sylvia Plath by the poet Jean Valentine. The finding aid is online here. The following description is from a subseries of prose materials: 6.8-6.9. Plath, Sylvia, 1995-1998, n.d.: letter to the editor of The New Yorker, an unpublished piece titled "Notes on Sylvia Plath", and clippings about Plath. If anyone out there has seen this material, please let me know. Otherwise, I'll try to get access to it one day. 'No Other Appetite': Sylvia Plath, Ted Hughes and the Blood Jet of Poetry has won the Leab Award for the Best Exhibition Catalogue or 2006. Congratulations! The catalogue accompanied an exhibit at the Grolier Club in New York City in 2005. I had the chance to see it and found it to be a remarkable exhibit of both poets' work. The catalogue is worth every penny and is illustrated. There are currently five for sale at abebooks.com. "Every year the American Library Association gives its Leab Award for the best exhibition catalogue produced in the United States and Canada. The Leab is a juried competition, run by the College and Research Library Division of the ALA. "
The Houghton Library at Harvard University has a small Sylvia Plath collection. The finding aid for the collection is online here. 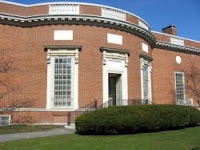 I work at the Houghton Library and will try to see the collection sometime soon. The collection consists of two drafts of a poem entitled "Sickroom Tulips" ("Tulips"?) and a letter to John L. "Jack" Sweeney, a Harvard professor and friend of both Plath and Hughes. Click here for a good biographical history of the Sweeney's. (1) Plath, Sylvia, 1932-1963. Sickroom tulips. A.MS.s. ; [n.p., 1961]. 3s.(3p.) env. With A.MS. poem by Ted Hughes "You roam with my every move" on the reverse side. I am most of the way through Tracy Brain's essay and find it interesting; I am huge Brain fan and thoroughly enjoy and recommend her The Other Sylvia Plath. To my surprise, a review of The Restored Ariel that I wrote and published via The Sylvia Plath Forum is quoted! In the last few years, there has been a critical backlash against Plath and biography, due in part to the fictionalization of Plath in two novels, and the biopic starring Gwyneth Paltrow. Plath and her biography are linked inextricably, and far too many people (myself included perhaps) rely too heavily on Plath's biography. Perhaps some find that using Plath's biography makes it easier to interpret her writing? I think for every argument against reading Plath biographically, there is also the case that one can benefit in their reading of Plath's writing because they have biographical knowledge. It certainly helps me! My experience of tracing and photographing Plath-related places has boosted my knowledge of her biography, and also has helped me to understand much of her writing. Seeing the places that Plath wrote about is an indispensable entracnce into the works. Another recent essay, printed in Gill's Cambridge Companion, is by Susan R. van Dyne; that essay is the first in the book and is entitled "The problem of biography". Both the van Dyne and the Brain essays are well written, thoughtful, and convincing. The John M. Olin Library at the University of Washington in St. Louis, Missouri, has a couple different Plath collections. They have a Hughes Collections as well as the papers of Lee Anderson. Lee Anderson met Plath and Hughes around 1958, and recorded both poets reading their poems during their time in Northampton and Boston. November graveyard [poem]. Ts, with corrections, 1p., . (27 April 1958). Spinster [poem]. Ts [carbon], 1p., . (27 April 1958). On the plethora of dryads [poem]. Ts, 2pp., . (27 April 1958). On the difficulty of conjuring up a dryad [poem]. Ts, 2pp., . (27 April 1958). Battle-scene from the comic operatic fantasy "The Seafarer "[poem]. Ts, 1p., . (27 April 1958). Sow [poem]. Ts, 2pp., . (27 April 1958). All the dead dears [poem]. Ts, 1p., . (27 April 1958). The earthenware head [poem]. Ts [carbon], 1p., . (27 April 1958). On the decline of oracles [poem]. Ts [carbon], 2pp., . (27 April 1958). Departure of the ghost [poem]. Ts [carbon], 1p., . (27 April 1958). The disquieting muse [poem]. Ts [carbon], 2pp., . (27 April 1958). Poem for Paul Klee's [poem]. Ts [carbon], 1pp., . (27 April 1958). The Hughes Collections (finding aid online here) contains five letters from Plath and Ted Hughes to Olwyn Hughes and Graham Ackroyd, an artist. Other Hughes/Ackroyd correspodence is held at the University of Victoria, British Columbia. Below is a description of the letters from the finding aid. Autograph letter signed, from Sylvia Plath to Olwyn Hughes, describing their recent activities at Smith, and discussing their hopes and plans for writing in the next few years. Autograph letter signed, from Ted Hughes to Graham Ackroyd, inviting him to visit them in London when he is there. Autograph letter signed, from Sylvia Plath to Olwyn Hughes, describing their moving-in activities; ms. note from Ted Hughes appended to letter from Sylvia Plath to Olwyn Hughes. Autograph card signed, from Sylvia Plath and Ted Hughes to Olwyn Hughes, describing winter in Boston. Autograph letter signed, from Sylvia Plath to Olwyn Hughes, discussing her current work and commenting on their life in America. The special collections library web site is here. I love finding aids and the internet. I just found a finding aid for a small Plath/Hughes (primarily Hughes) collection held in the McPherson Library at the University of Victoria, British Columbia, Canada. "Afternoon at Hardcastle Crags" story by Sylvia Plath, 1 typed page numbered "6". "Side-Hall Girl" story by Sylvia Plath, 1 typed page numbered "2". "The Shadow" story by Sylvia Plath, 1 typed page numbered "3". "The Devil of the Stairs: Poems by Sylvia Plath" Title page only of typed MS by "Sylvia Plath / 26 Elmwood Road / Wellesley, Massachusetts" (An early title for The Colossus, Hughes states: "in May 1959 she wrote: 'Changed title of poetry book in an inspiration to The Devil of the Stairs. . . this title encompasses my book and "explains" the poems of despair, which is as deceitful as hope is.' This title lasted until October, when she was at Yaddo...."). "The Sculptor" poem by Sylvia Plath, 1 page carbon typed with autograph corrections. Written in top right: "Grecourt R & Arts in Society". "For Leonard Baskin" written after title. (Published in Grecourt Review, May, 1959). "Alicante Lullaby" poem by Sylvia Plath, 1 typed page . On top right corner: "Sylvia Plath / Suite 61 / 9 Willow Street / Boston 8, Mass." (Published in Crystal Gazer, 1971). Short book reviews by Sylvia Plath, typescript, 1/2 page, page numbered "3" (Human and animal doodles on page, in ink). "Venus in the Seventh" (story) by Plath 1 typed page numbered "62". King's College at Cambridge University (Cambridge, England) holds a small collection of 25 letters from Sylvia Plath to Mallory Wober. Plath met Wober in 1955, during her time as a student at Newnham College. I read through these letters, held in the Archives Centre, King's College, in February 2004. Unfortunately, it was too late to incorporate any of the information I obtained into my biography of Plath. The letters are interesting, and detail an aspect of Plath's life in Cambridge prior to her meeting Ted Hughes in February 1956. Robin Peel, author of Writing Back: Sylvia Plath and Cold War Politics, used the letters for his 2004 essay "The Ideological Apprenticeship of Sylvia Plath" which appears in The Journal of Modern Literature, Volume 27, Number 4, Summer 2004, pp. 59-72. They've also been referred to one or two other times. King's College Archives Centre website. Linebaugh Public Library will host Bookends: Summer Lecture Series beginning June 12 and running though Aug. 14. This series provides an in-depth study of contemporary literature for readers who want to delve a little deeper than the typical book discussion group. The theme of this years’s series is husband and wife authors, such as Michael Chabon and Ayelet Waldman, Sylvia Plath and Ted Hughes, Jonathan Safran Foer and Nicole Krauss. The MTSU faculty lecturers will consider how husband and wife authors, who, although they do not write together, influence each other’s work. Library Director Laurel Best works with MTSU faculty members in putting together the Bookends: Summer Lecture Series, which is now in its second year. Last year’s lectures focused on National Book Award winners, and featured the works of Joan Didion, Andrea Barrett, Orlando Patterson, Polly Horvath, Carlos Eire and Tim O’Brien.